All of them are unsatisfactory, in no small part because they cannot account for the Moon's angular momentum and near-circular orbit relative to the Earth. 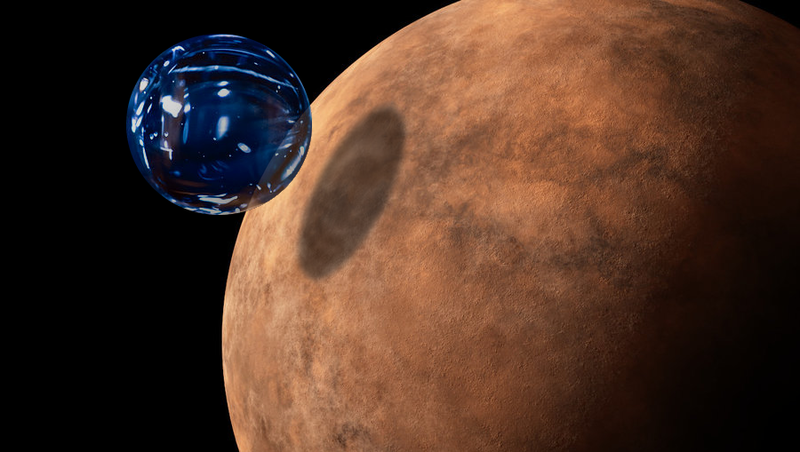 The current reigning hypothesis is that a Mars-sized planetoid (named "Theia") struck a glancing blow to the proto-Earth (sometimes called "Earth Mark I"). Earth Mark I is imagined to be more watery than our present Earth, and slightly smaller in mass, with a shorter day, yet not a particularly inviting place; at least not for life as we're accustomed to it. Fascinating as this is, it's not what I want to report today, so I'll let Wikipedia explain it. I'll only mention that it's not entirely without problems, notably that actual analyses of Moon rocks retrieved by the Apollo missions don't match the chemistry predicted by this hypothesis. Variations exist to address this, including the "Drop-Moon hypothesis"... that a more head-on impact caused a splash of molten Earth that coalesced into a "drop" that became the Moon. While the giant impact hypothesis has yet to account for a few things, it seems, on the face of it, intuitively more reasonable than the supposition, once widely and seriously held, that the Moon formed by planetary fission... in other words, that the Earth simply spit it out. The usual mechanism for this is imagined to be centrifugal force from a still-soft and rapidly-spinning proto-Earth. As classically stated, this is highly unlikely. Can you see the problem? 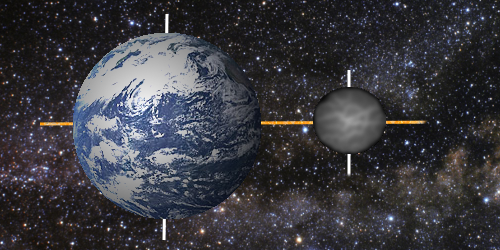 As illustrated above, the Earth and Moon would share the same axial tilt. But that's not what we see... in truth, the Moon's orbit is more closely aligned with the ecliptic plane than the Earth's equator. That is, the Moon properly orbits the Sun concurrently with the Earth. 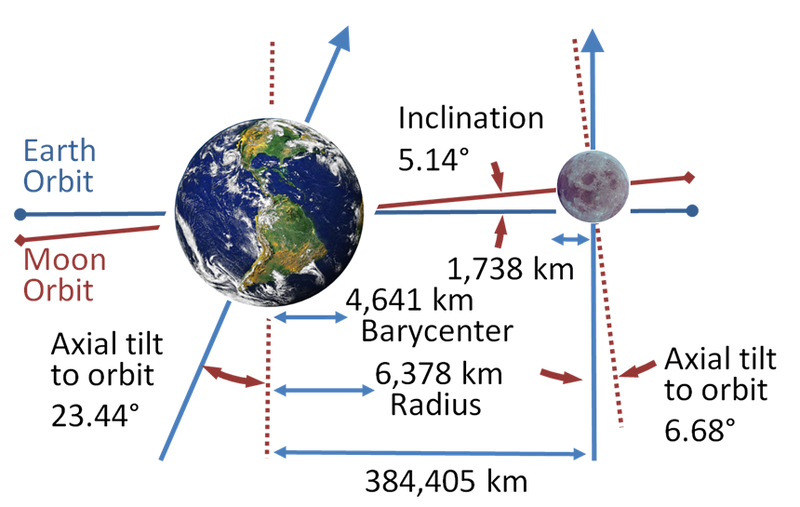 If you were to plot it out, the Moon's path around the Sun is very nearly the same as Earth's. As unlikely and ridiculous as the Fission Theory may seem at first glance, this old model (surprisingly!) still has legs. 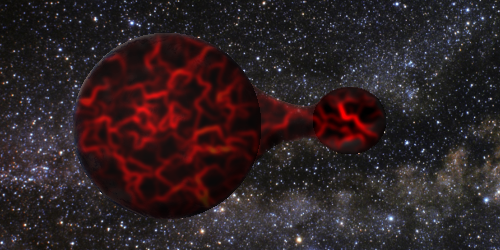 One new variation is proposed by Japanese astronomer Okej Tenyoshou, professor emeritus of crypto-planetology and holder of the Kaiju chair at Toho University in Tokusatsu, Japan. Tenyoshou seeks to provide a model that better accounts for the similar chemistry of Moon rocks than does the Theia hypothesis. Is it April 1st again? Man, where did the year go?